To provide the highest level of care to our patients, our office utilizes the most progressive technologies in dentistry today. These advances allow us to detect dental concerns at early stages, treat your dental issues with precision, and provide stunning and customized restorations in a timely fashion. Our premium dental charting and scheduling system maximizes your time and our office efficiency. Our office utilizes digital radiography to reduce our patients’ radiation exposure and provide the clearest images. Our devices allow for both patient comfort and precise imaging. Digital radiography aids in early detection of many dental issues as well as providing visual documentation before and after treatment. Read More. 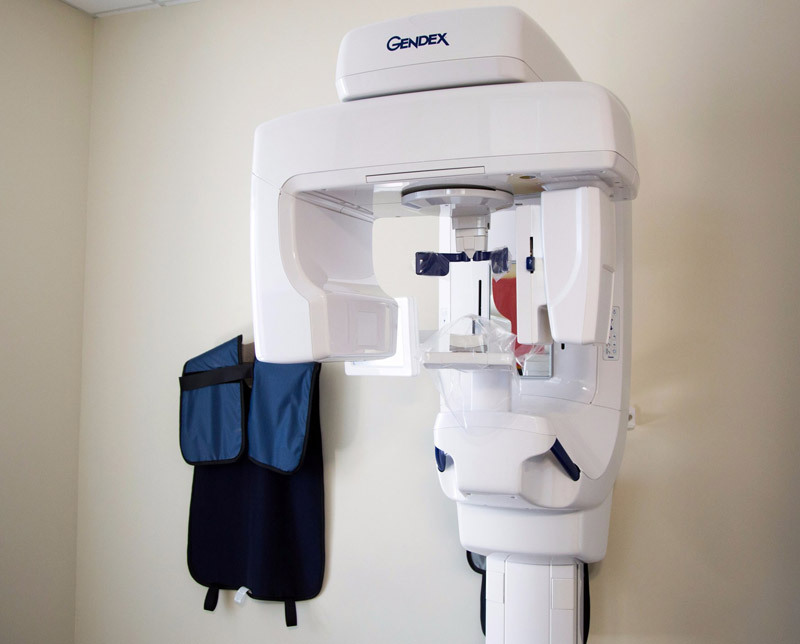 This technology allows us to acquire a 3D image that allows us to further diagnose many problems that would otherwise not be seen on a traditional x-ray. Cone beam technology allows us to precisely and predictably place dental implants. Read More. The use of small intraoral cameras help both us and our patients clearly see the condition of their teeth and gums. The images are displayed on our screens, allowing patients to see areas being worked on and gain a better understanding of dental procedures being performed. Read More. Laser dentistry is the latest advancement in dental technology, treating a wide range of dental and cosmetic problems from cavities to gum disease to teeth whitening. The lasers we use in laser dentistry at our practice are an alternative to the common hand-held scalpel, drills, or other tools. Dental lasers have been approved by the Food and Drug Administration and are safe for both adults and children. The Solea laser we use in our office significantly reduces the need for a needle injection for anesthesia as well as allowing more dentistry to be performed in less visits. Read More. Tongue tie, or ankloglossia, is a condition that restricts the movement of the tongue when an unusually tight, short, thick band of tissue anchors the underside of the tongue to the bottom of the mouth. This condition is usually present at birth and can prevent good latch during breast or bottle feeding causing difficulty at feeding time. In older children, tongue tie can cause speech and eating problems. The Solea dental laser can be used to treat this condition in a very short, in-office procedure that does not require injections or sedation. The procedure can be done on newborns, infants and older children alike. The laser frenectomy for the treatment of tongue tie is done in conjunction with a licensed, experienced lactation consultant. The lactation consultant helps with parent and patient education as well as post-care stretching exercises. Read More. DIAGNOdent is a small portable laser that allows us to detect hard to see cavities on the chewing surface of the back teeth. The laser is easy to use, harmless, and will alert us with an audible signal if it detects a cavity. It will even calculate the approximate size of the cavity so we can better plan treatment. Carivu is a device that uses transillumination technology to aid in the diagnosis of cracks and cavities in the teeth. Both tools are noninvasive and allow cavities to be accurately detected and treated in their infancy. Read More. A filling is a way to restore a tooth damaged by decay back to its normal function and shape. If you have a tooth that requires a filling, the dentist will first remove the decayed tooth material, clean the affected area, and then fill the cleaned-out cavity with a filling material. A filling also helps prevent further decay by closing off any cracks or spaces where bacteria can enter. Read More. Bonding is a conservative way to repair slightly chipped, discolored, or crooked teeth. During dental bonding, a white filling is placed onto your tooth to improve its appearance. The filling "bonds" with your teeth, and because it comes in a variety of tooth-colored shades it closely matches the appearance of your natural teeth. Read More. We use Computer-Aided Design (CAD) and Computer Aided Manufacturing (CAM) to create customized crowns, bridges and other dental restorations in the office, often in a single visit. These crowns and bridges are long-lasting and well-fitting. Read More. Crowns are synthetic caps, usually made of a material-like porcelain, placed on the top of a tooth. They are used to replace large fillings, protect weak teeth from fracturing, fix a fractured tooth or cover a tooth that has had a root canal or a dental implant. Using our advanced CAD/CAM technology, this is done on-site and in a single visit. Read More. Also produced by CAD/CAM, bridges are custom-made appliances that can replace missing teeth in both appearance and in function. Read More. Dentures are removable replacements for missing teeth and surrounding tissues. These are custom devices that either replace some or all the teeth while restoring your smile and mouth function. Read More. Root canals are performed when a cavity and infection reaches all the way to the pulp of the tooth. This is diagnosed in our office. A root canal cleans out the infected pulp and the canal is filled to prevent further infection. Most patients who have root canal experience little or no discomfort or pain, and enjoy a restored tooth that can last almost as the original tooth. Read More. Sealants are used to fill in narrow grooves in a tooth that cannot be adequately cleaned by brushing. These sealants help prevent cavities in the grooves and pits. Read More. Sometimes due to severe decay, infection, or fractures, teeth must be extracted or removed. We can do this in the office, often the same day as your exam. Read More. A dental implant is an ideal tooth restoration for people who are missing one or more teeth because of injury, periodontal disease, or any other reason. The implants themselves are tiny titanium posts that are surgically placed into the jawbone where teeth are missing. Our doctors are experts in placing implants and restoring them with crowns that look and feel like natural teeth. Read More. Veneers are thin pieces of porcelain or plastic cemented over the front of your teeth to change their color or shape. Veneers are used on teeth with uneven surfaces or are chipped, discolored, oddly shaped, unevenly spaced or crooked. Very little tooth structure is removed and the results are cosmetically pleasing. Read More. The Invisalign treatment is an alternative to traditional braces for fixing crooked, malaligned teeth, but since the trays are made of clear plastic, they are virtually invisible. In addition, because Invisalign trays are removable, they can be taken out while eating, drinking, brushing and flossing. Read More. A sleep apnea appliance is a hard, plastic custom-made device that is worn while sleeping to treat sleep disordered breathing. The device will prevent your airway from collapsing by holding the tongue or by supporting the jaw in a more forward position. Read More. Mouthguard are recommended to protect the jaw and teeth during physical activity and sports such as football, lacrosse and hockey. Impressions are made in the office and the guard is fabricated in our onsite laboratory. A variety of styles and colors are available. Read More. Bruxism or grinding or clenching your teeth can lead to jaw and teeth pain, earaches, headaches and even broken teeth. Nightguards are custom-made by your dentist to prevent contact with opposing teeth. Read More. Whitening can be used to treat stained and discolored teeth, or simply to enhance a dull smile. This can be done in the office with a laser or done at home using plastic trays and a whitening gel worn for short periods of time. Read More.